The Venue offers a mosaic of specialised in-house services from state-of-the-art technical equipment to enticing menu food designs, created by our in-house chef. 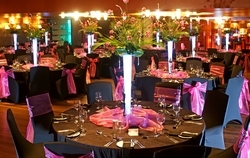 With a unique blend of passion, personal touch & premium service, we at The Venue will provide you with signature solutions to creating a spectacular occasion. Situated in the vibrant and exclusive Melrose Arch Precinct, The Venue is easily accessible from the M1 highway, and there is ample undercover parking for clients' peace of mind and convenience. We are open for events seven days a week, making us the ultimate conference, corporate and social functions venue choice.